There are different types of travellers. There are those who like to rough it, backpackers,' as they are called. Backpackers travel on a limited budget and their travels don't involve much planning. There are others for whom a holiday means living in the lap of luxury. They will plan every detail in advance, so they do not face any inconvenience on their holiday. These are the kind of people who don't mind spending while on holiday, since their priority is comfort and relaxation. Pondicherry has many 4-star and 5-star hotels for such travellers. This popular tourist destination in South India was a French colony, and you can see the influence in the architecture style of churches, colonial buildings, statues, etc. Tourists from all over India and the world come to Pondicherry, for it has much to offer everyone. The Sri Aurobindo Ashram is of course, most popular with all tourists for the peace and serenity that it offers. Whenever you plan a trip to Pondicherry, we can help you find some wonderful luxury accommodation options. Pondicherry has much to offer all who visit this calm and scenic city. You can visit the churches, temples, museums, stroll on the scenic beaches, enjoy the delicious cuisine, and do so much more. 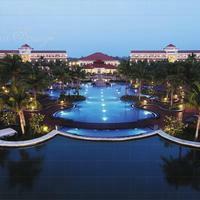 If you are the kind of traveller who wants a comfortable and luxurious holiday, you can browse through the various incredible 5-star Pondicherry hotels. These hotels offer some excellent facilities for the truly discerning traveller. Amenities such as 24-hour room service, restaurants, coffee shops, dry-cleaning and laundry services are the norm. These hotels also offer excellent facilities for business travellers such as audio-visual equipment, printer, projector, fax, scanner, photocopier, business centres, conference rooms and much more. You can also book airport pick and drop services and ask the concierge to book a city tour with a guide. You name it, and a 5-star hotel will try to fulfil all your requests. Most of these hotels may also have gymnasiums and fitness centres, beauty and wellness services, recreational centres, discotheque, and also gaming centres. A stay at a 5-star hotel in Pondicherry will leave you feeling totally refreshed and rejuvenated. After a long day of sight-seeing, you can relax in in the plush comfort of your room, as the attentive staff caters to your every request. In fact, if you're looking to spend a romantic evening with your loved one, some hotels even offer babysitting services, so you can enjoy in peace. The food in these hotels is another thing to look forward to. Prepared by world-class chefs, they can offer you delicious cuisines from all over the world. Booking a stay at a 5-star hotel is by no means cheap. However, we can help you get some amazing deals on these hotels. Plan your holiday in advance, and check for discounts and offers that they keep offering. Do an online survey of the hotels you may be interested in. The genuine customer reviews on the Cleartrip website can help you make up of your mind. Once you shortlist your favourite ones, keep checking for deals. Online hotel booking through Cleartrip is a hassle-free experience, one you are definitely going to cherish for years to come. The Ocean Spray Hotel located on the scenic East Coast Road is one such wonderful option. 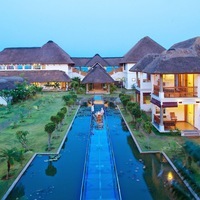 Another good option is the Le Pondy Beach and Lake Resort. Apart from these Cleartrip has a wide range of options for you to choose from. So, start looking for hotels near me, and book yourself a fantastic holiday!